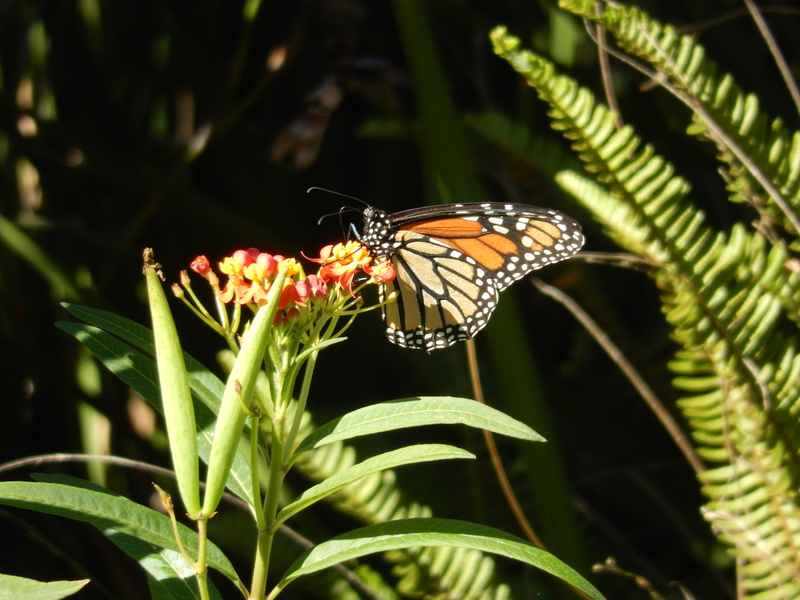 The ONLY plant that monarch caterpillars can eat is milkweed. There are many varieties, so it’s best to buy the ones that are native to your area if you’re interested in helping the monarch butterflies reproduce. 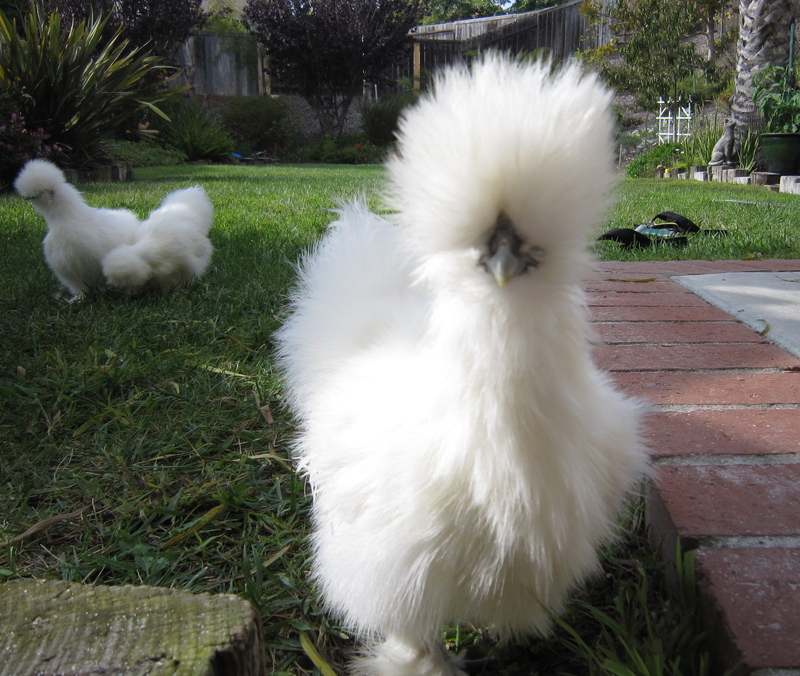 It’s kind of like a science experiment in your yard. I have learned things about these amazing creatures through seeing them live through their life cycle that I never knew before. And it started with one plant. Sure these little guys will start off tiny and within a matter of days double their size over and over. In the process they will systematically eat every single leaf and flower off your milkweed. But it’s okay. Because milkweeds are built for this. They will grow back. And then a monarch or two will lay eggs on it again and it’ll get mowed again and it will again grow back. So when my daughter and I counted 38 baby caterpillars on our ONE milkweed about a week ago, I knew they would run out of feasting material fast. So I went to the nursery and bought 3 more plants. Then 2 days later I bought 6 more. And they were finally happy and fat and had had their fill of the buffet. Whew! It was then that I got worried. They were lethargic and many had curled up. I calmed my concerns with a quick internet search informing me that they do this before getting ready for their next stage in the chrysalis. And then they started disappearing. They were off to find their magic place to make their final transformation into a butterfly. I managed to find 4 of them in a nearby tall bush called “pink breath of heaven”. When they attach themselves to wherever they have chosen and form their “J” as my daughter likes to call it, they are C O M P L E T E L Y still. Take a glimpse at the 3rd and 4th pictures below. That’s the same caterpillar before and after the chrysalis. And the time in between taking those shots today? 2 hours. That’s it. You can youtube a video of a time lapse of this process if you’re interested. Pretty amazing. Now we wait! I was thrilled to stumble across this chrysalis, which is the first one I’ve ever seen in my own yard. I showed my daughter and husband and was quite impressed that I could see the butterfly’s wings through the beautiful chrysalis. Do you see it? The gold edging and dots are also most elegant. The caterpillar traveled approximately 40 feet from the milkweed plant to this location (on the back of a worn metal patio chair). It seems that butterflies migrate even as caterpillars! This last photo is sort of a “Where’s Waldo” of caterpillars. 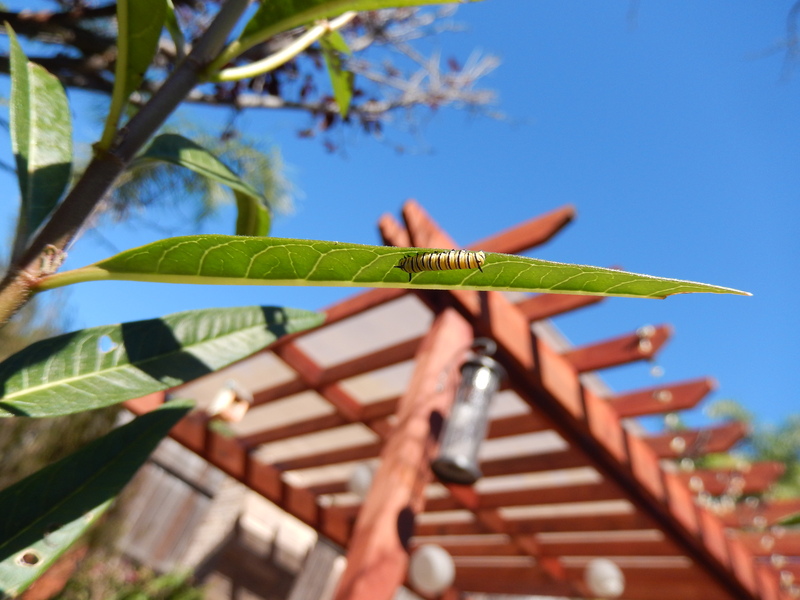 It’s exciting seeing these caterpillars grow so fast on the milkweed. My mom told me that when they’re big enough, they leave the plant to find a safe place to make their chrysalis. I was relieved to hear this because last week’s large caterpillar seemed to have disappeared and I was worried about a bird having eaten it for a snack! 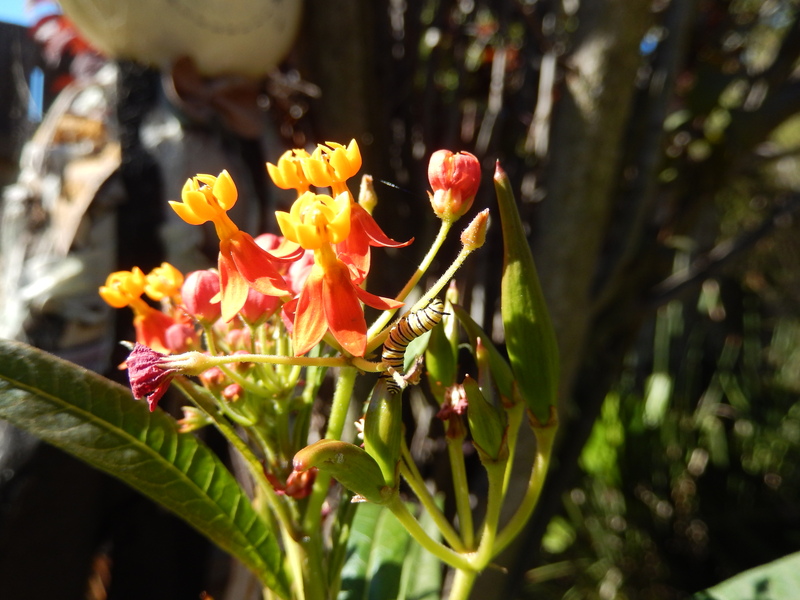 (By the way, my mom gets all the credit for inspiring me to buy a milkweed plant. She has many in her front yard and even though she doesn’t care for the twiggy look it has after the caterpillars have eaten it all up, she knows the plant will grow back to feed a whole new crop of future monarchs.) Seeing the butterfly’s life cycle in action is also a wonderful science lesson for kiddos. Do butterflies in your neck of the woods a favor and get a milkweed plant! 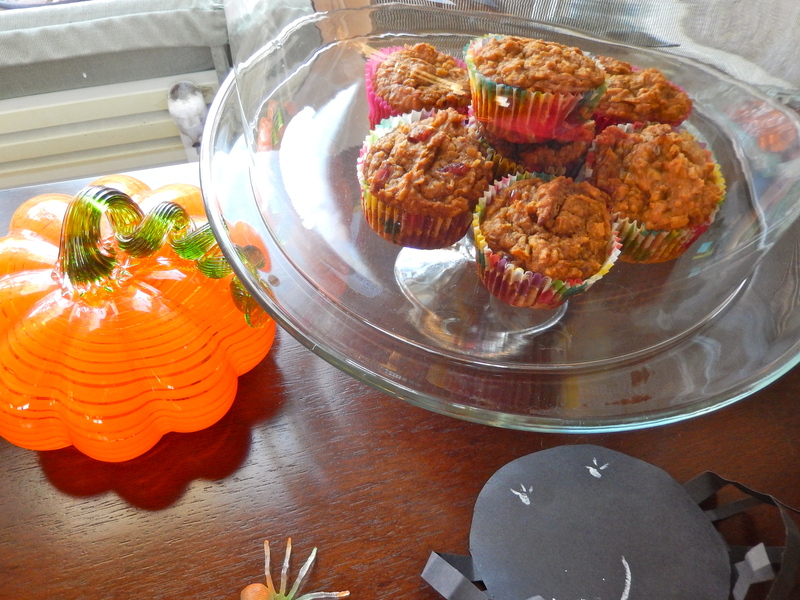 I still enjoy baking with agave instead of cane sugar and I recently found a fabulous recipe for pumpkin agave muffins (I added the cranberry part) on the blog, Hell Yeah It’s Vegan! (This link will bring you right to the recipe.) They are moist, not too sweet and full of pumpkin-y goodness. The only other tweak I made was switching regular flour for whole wheat flour. I made them a second time around and reduced the flour to 1 and 1/4 cup to make way for adding 1/3 cup of Coach’s Oats (also interchangeable with Old-Fashioned Oatmeal). 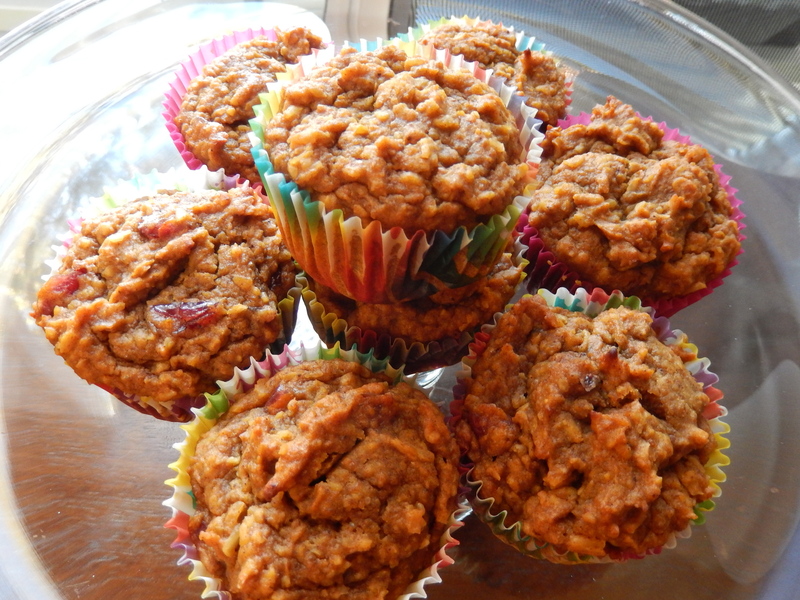 And Pumpkin Cranberry Oat Agave muffins were born! I brought them to a morning work meeting and they were a hit! 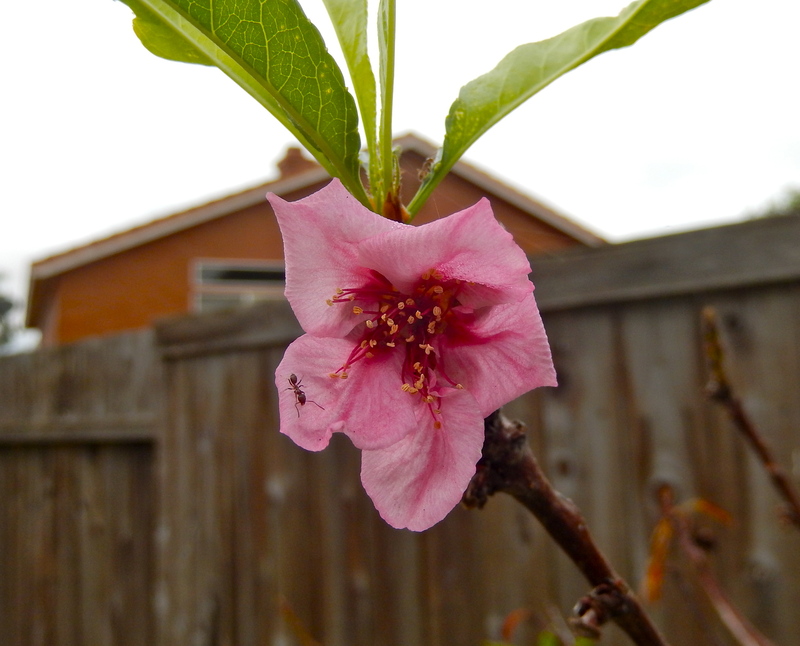 I’ve never had a fruit tree bloom quite like this before! Doesn’t it know that apples and pumpkins get to be the star now? It has just really started to cool down here in southern California. 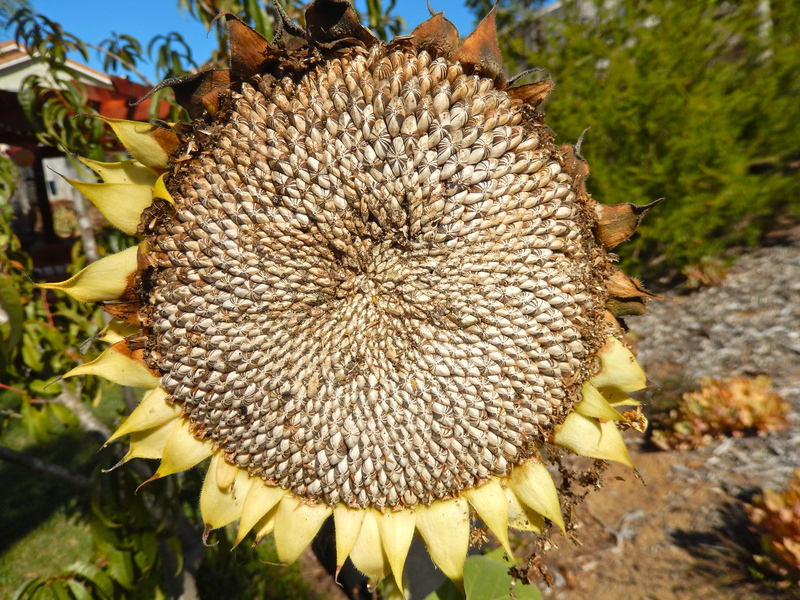 I can almost guarantee that this bloom will fizzle before it bears fruit, but it’s an interesting site in the garden. 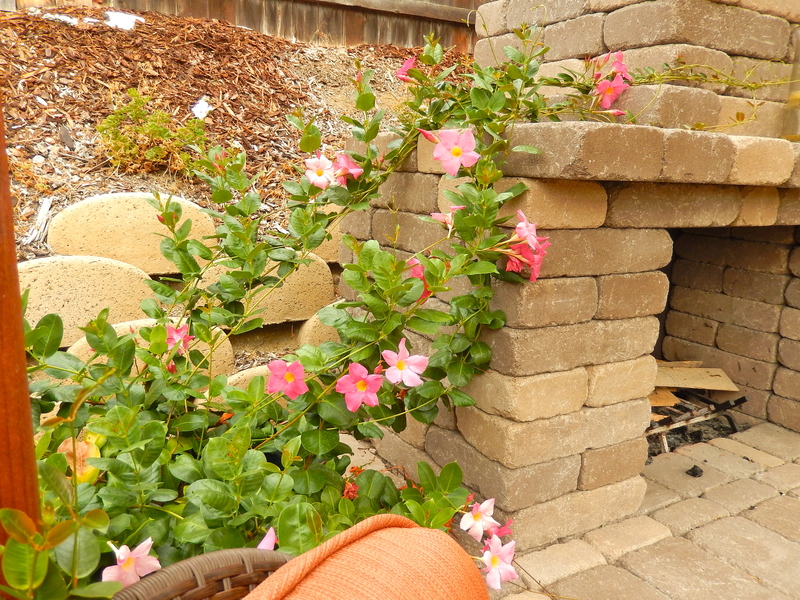 The potted pink mandevilla next to the outdoor fireplace it definitely more sure of itself and I’m happy to report that it’s creeping along the mantel quite nicely, situating itself in the cracks of the stones. I decided that with my lackluster fruit tree growth this year, I would adopt a technique that I used for the Spice Zee Nectaplum when I planted it this spring and it did fab. 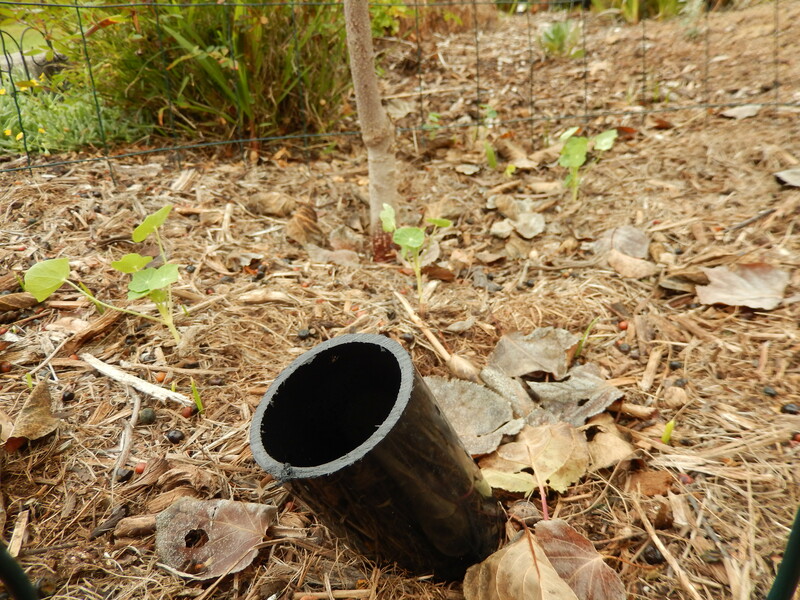 When I planted it, I also planted a two foot long plastic pipe found in the hardware center plumbing section. I use it to give water directly to the roots deep in this hard, dry soil. So, I picked up 6 more and carefully dug holes around my already planted fruit trees and positioned them down in the ground. I also drilled about 4-5 holes in the lower half of the pipe to give water all around. Here’s to a fruitful 2015. 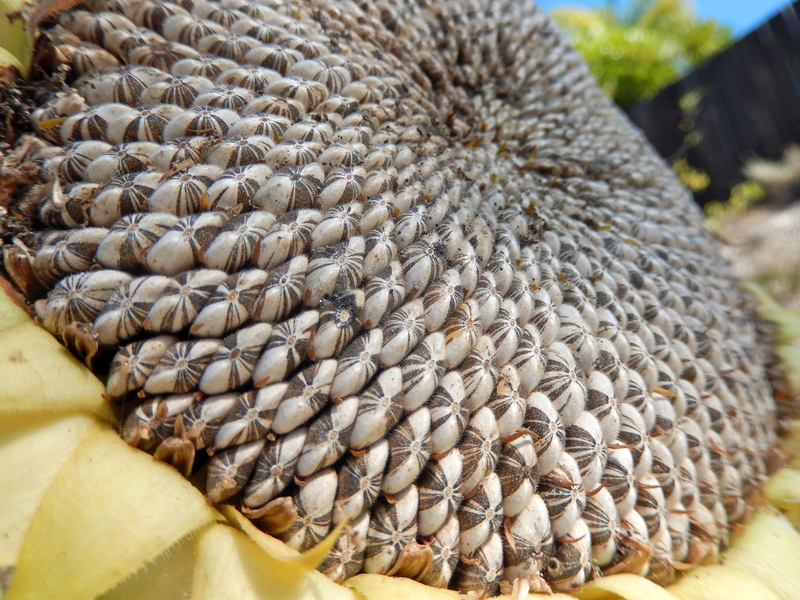 The center part of this 5′ tall sunflower has finished drying in the sun and the seeds are now exposed. I’m planning on roasting these home-grown seeds. Since this will be my first time doing my own roasting, I looked up this recipe, which only involves boiling the seeds in a pot of salted water and then roasting them in the oven. I’m looking forward to seeing how they turn out! 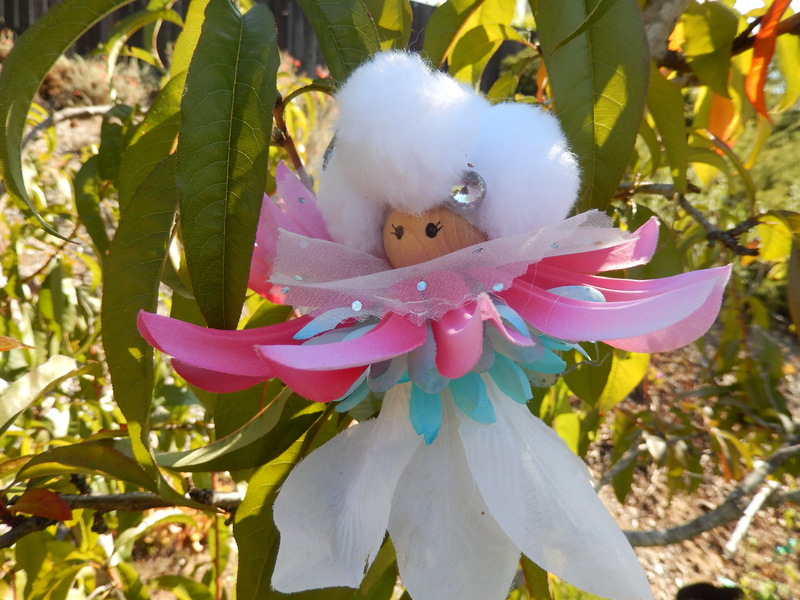 And the Red Baron peach tree fairy gives her approval after many weeks of overseeing the sunflower seed soldiers. Lou Murray's Green World-So Cal.